EzineArticles Asks: What Tools Do You Want? In yesterday’s post, we featured the top 7 article writing tools and resources you can find right here on EzineArticles. First, consider what tools you use as well as what would make your efforts, by a large or small degree, easier. 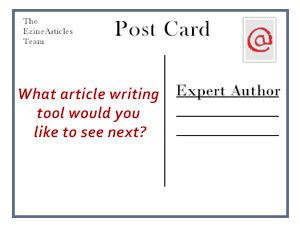 Next, share what article writing tool you would like to see next in the comments section of this post! We look forward to the discussion and perhaps even a little debate because you never know what you might inspire next. I want to re-write content tools. I think the spell-checker should be a bit updated. I think there should be a program that detects whether or not people who use my content on my site – that actually leaves my signature box at the end of the article. I would highly agree with you that writing articles and submitting it to EzineArticles is highly beneficial. Not specifically only for getting traffic to your site. I actually don’t regard the traffic from my articles as real and targeted. But I am much more into the links. Off course there would be some of them that could be interested in your service or program you promote. But getting 1 backlink from EzineArticles, is like getting 100 backlinks from articlesbase/ goarticles. THAT is how much authority it has. From what I have seen: Sites with only 2 links from 1 ezine article, ranks #6, #7 and #4 out of competitive search phrases some from nearly 3 million search results. Absolutely phenomenal!